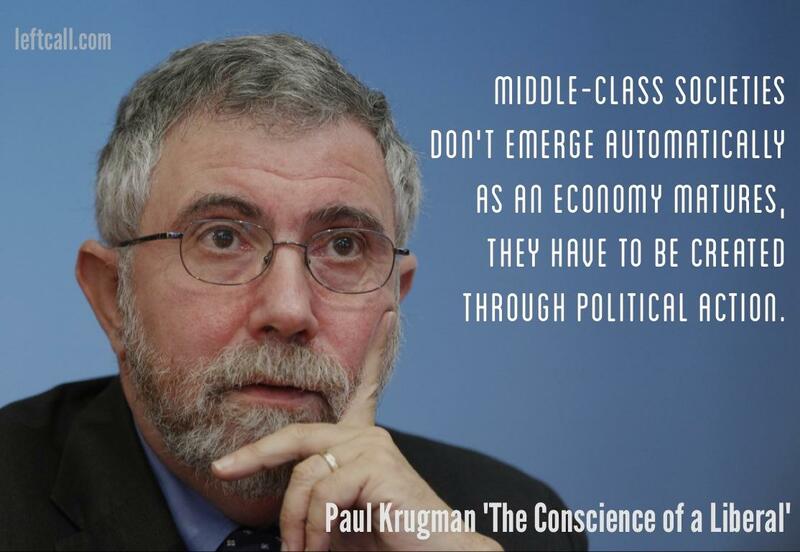 Paul Krugman (“The Conscience of a Liberal“) — Middle-class societies don’t emerge automatically as an economy matures, they have to be created through political action. Knee-Jerk Reactionary Conservative (Libertarian) — What an idiot. FB put this ad on my page as something I might like. Ha! You idiots are not liberals, George Washington was a Liberal. Liberal comes from the word Libertarian. You idiots stole it after progressive became such a hated word by Americans. I can’t think of anything Liberal about leftist statists! You want to control people and when you can’t, you respond by trying to silence them, calling them a bigot, homophobe or racist. Your president uses the IRS to attack opponents and you say nothing. You support ObamaCare even though you know it has death panels designed to ration healthcare for the elderly and also knowing that it is unaffordable. You were against the wars in the middle east until Obama began starting them, now just where is the anti-war movement? Do you think FB will ban me for making this post? They don’t seem to have a problem with the Kill Sarah Palin page, even though the page is becoming more violent. Maybe they will ban me, but at this point, I no longer care. Time for a libertarian alternative anyway. And after all that, Krugman’s statement still remains true. There’s some truth in your claim of a liberal and libertarian connection, and that connection still exists today. But the difference with many modern liberals compared to liberals in early America is that modern liberals are social liberals. That means they covet individual liberty, but recognize inequality (economy, racial, etc.) diminishes liberty. Modern social liberals also recognize, as Krugman does, that through much of human history there was no such thing as a middle-class. It took political action and liberal governing (including progressive taxation), combined with modern capitalism, to create a middle-class. And you have it backwards. The word progressive started being used because the word “liberal” became a bad word. But the word liberal is making a comeback. Nobody is silencing anybody, but we will call out bigotry when it happens. The president had nothing to do with the IRS targeting, and the targeting had nothing to do with oppressing conservatives. And only bias sees it any other way. That’s why that story is over. Obamacare does not have death panels and you know it. You are talking about rationing, which we already have in this country in the form of haves and have nots. Tens of millions of Americans without health care is our current form of a “death panel.” And emergency room visits (because they won’t turn you away) is not a solution to our health care problems. I’ve been against the wars for a long time now, long before Obama was elected in 2008. Maybe there are some liberals who haven’t been as vocal since Obama was elected, but there are plenty of liberals who have been very consistent being against the wars and drone strikes.